Our new and improved online tool helps customers find the right incontinence products from more than 660 choices, saving time, money and frustration. Customers buying incontinence products for the first time waste an average of $130 trying products before finding what they need. But our new and improved, easy-to-use online tool changes all that. We’ve redesigned our Incontinence Product Finder to be by far the most useful of any free online tool of its kind. With dozens of continuously changing names for styles, sizes, absorbency and features, it’s no wonder customers are confused. absorbency, style and brand. By selecting a product based on the resulting list, a customer can see features, quantity, price and whether a sample is available without leaving the page. Like all areas of our Web site, this innovative new tool is designed with the senior shopper in mind. User-friendly features include a new, easy-to-understand section explaining incontinence product styles, accessible via an easy-to-find link from the Incontinence Product Finder page. At the bottom of the Incontinence Product Styles page, shoppers have one-click access to the finder tool, frequently asked questions, sample service and information on how to become a product tester. 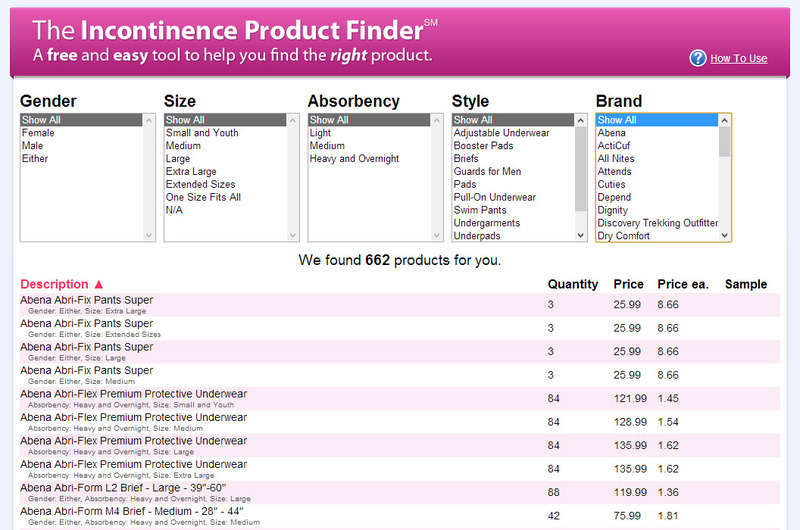 The new and improved Incontinence Product Finder makes use of the latest software from Google called Angular JS. The result is a significantly faster connection by the consumer to the data stored in the Incontinence Product Finder. Moreover, the logic behind this unique tool makes the Incontinence Product Finder smoother, faster and more useful. The end result for our customers is helping them better determine the best incontinence product choices and reducing their chances of buying products that do not meet their needs. Another way we help customers avoid costly mistakes is allowing them to try samples before they buy; customers pay only a minimal shipping cost. By combining our Incontinence Product Finder with our “Try Before You Buy” sample service, we’re providing caregivers with tools to help avoid the costly mistake of buying incontinence products that don’t meet their needs. Those with questions also have free access to The CareGiver Partnership’s team of knowledgeable Product Specialists, all of whom are current or former caregivers themselves. Calls usually are answered by the third ring by real people based in Neenah, Wis. The free customer service number, available Monday through Friday, 9 a.m. to 4 p.m. Central Standard Time, is 1-800-985-1353.
loved ones with answers to their caregiving questions, including information about home health care products and supplies, from our Wisconsin-based team of Product Specialists who are all current or former caregivers. The company’s Web site provides the largest online library of resources on subjects most important to caregivers — from arthritis to assisted living, and Parkinson’s to prostate cancer — as well as access to more than 3,000 home care products for incontinence, skin care, mobility, home safety and daily living aids. The CareGiver Partnership was founded in 2004 by Lynn Wilson of Neenah, Wis. Visit http://www.caregiverpartnership.com to learn more or call 1-800-985-1353. Help support this ad-free blog by answering several questions about caregiving here. It will take just two minutes. If One Pad is Good, Two is Better...WRONG! Diabetes and Incontinence, What's the Connection?